You've found the “U.S. 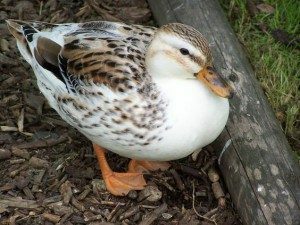 Appleyard Duck Breeders” page here at Hobby Farm Wisdom! If this is the first time you have visited our site: Welcome! The original Appleyard is a rare breed developed in West Suffolk with the mission to find the perfect combination of beauty, size, egg production and deep and wide breast. This is a large and heavyset bird that grows quickly and is popular for its abundant meat. The Appleyard ducks have an elegant appearance displaying a yellow beak and orange legs and feet. The standard color is silver. They are known to be resilient, hardy and friendly with the benefit of being quiet as well which makes them good for keeping at home or in a garden. They also come in a miniature variety.